Description of fields used when entering or importing archival descriptions using ISAD(G) in a CSV file or entering the data manually. ISAD Rule refers to the rule from the applicable standard and/or the instructions provided by AtoM. 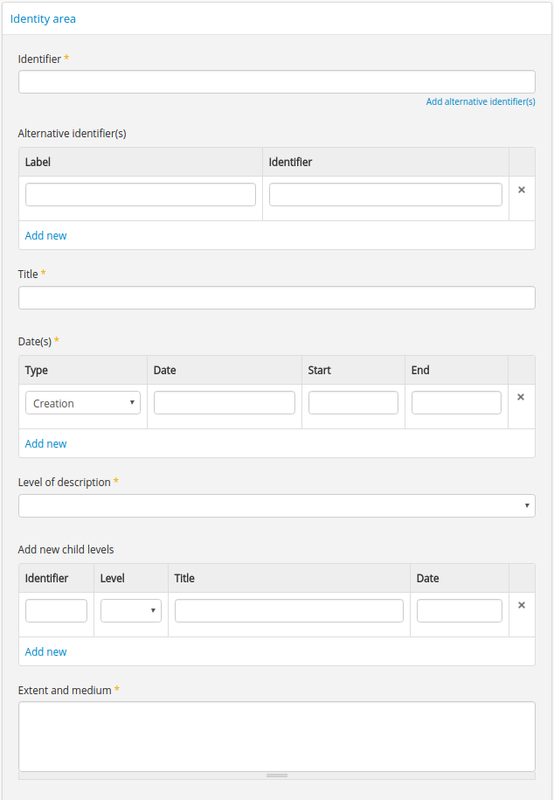 The data entry fields for the Identity area using the ISAD(G) template, including Identifier, Title, Dates, Level of description, Add new child levels and extent and medium. Depending on the “inherit reference code” settings in Admin > Settings > Global, this field can display to non-logged in users as “Reference code.” While editing the record, the full reference code including any identifiers inherited from higher levels will appear below the Identifier field. ISAD Rule Identify and record the date(s) of the unit of description. Identify the type of date given. Record as a single date or a range of dates as appropriate.” (ISAD 3.1.3) The Date Display field can be used to enter free-text date information, including typographical marks to express approximation, uncertainty, or qualification. When entering data in the template, users can choose an event type from a drop-down menu. The event types in ISAD(G) are Creation and Accumulation. When importing descriptions via CSV, use the eventTypes column. The CSV columns in 2.2 were titled creationDates and creationDatesType. Prior to 2.2, there was one CSV column called creatorDates. We have added fallback code so if the old name is used the import will still succeed. ISAD Rule Identifier: Provide a specific local reference code, control number, or other unique identifier. Level of description: Record the level of this unit of description. Title: Provide either a formal title or a concise supplied title in accordance with the rules of multilevel description and national conventions. EAD See the EAD mappings in the related fields above. This widget has been added to help improve workflows when creating new descriptions via the user interface. When entering descriptions through the form, users can add new child records in this area while creating a parent record. Fill out subsequent fields following the same rules as described for parent records. 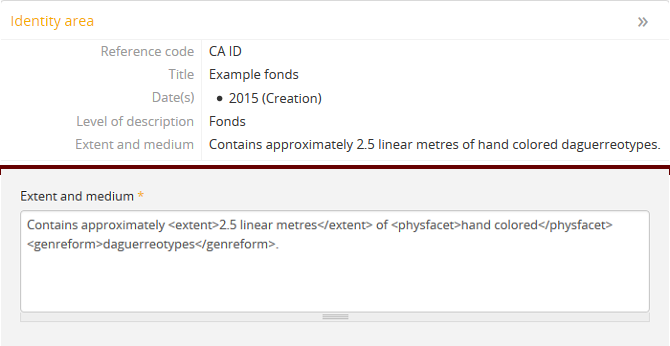 AtoM will allow users to add additional EAD subelements to field in the edit page to accommodate all the possibilities in EAD for more granularity, such as <extent>, <dimensions>, <physfacet>, and <genreform>. In the view page the EAD tags will be hidden, but preserved during export and re-import. The data entry fields for the Context area using the ISAD(G) template, including Name of creator(s), Repository, Archival history and Immediate source of acquisition or transfer. This is the default export EAD when an Entity type has not been set for the actor on the related authority record. The final EAD element can be more precise if the user has entered an Entity type on the related authority record. When the Entity type is set to Person, the EAD will export using <persname> instead of <name>; when set to Family, the EAD will export using <famname> instead of <name>; and when set to Organization, the EAD will export using <corpname> instead of <name>. The <name> element is the default when no entity type is set. For more information on authority records and the ISAAR standard upon which the authority record template is based, see: Authority records and International Standard Archival Authority Record for Corporate Bodies, Persons, and Families. When linking a creator to an archival description, you should only link at the highest level of description. AtoM will automatically inherit the creator name at lower levels. This conforms to ISAD(G)’s Multilevel Description Rule 2.4, Non-repetition of information: “At the highest appropriate level, give information that is common to the component parts. Do not repeat information at a lower level of description that has already been given at a higher level.” Linking a creator at all levels of description (instead of just at the parent level) in a large hierarchy can also impact performance. When entering data manually, this field is written in the authority record. If an authority record does not already exist, AtoM will create one when a new creator is entered. The user can then navigate to the authority record to enter the Biographical or Administrative history (see: Authority records). ISAD Rule Record the name of the organization which has custody of the archival material. Search for an existing name in the archival institution records by typing the first few characters of the name. Alternatively, type a new name to create and link to a new archival institution record. When linking an archival institution to an archival description, you should only link at the highest level of description. AtoM will automatically inherit the repository name at lower levels. This conforms to ISAD(G)’s Multilevel Description Rule 2.4, Non-repetition of information: “At the highest appropriate level, give information that is common to the component parts. Do not repeat information at a lower level of description that has already been given at a higher level.” Linking a repository at all levels of description (instead of just at the parent level) in a large hierarchy can also impact performance. 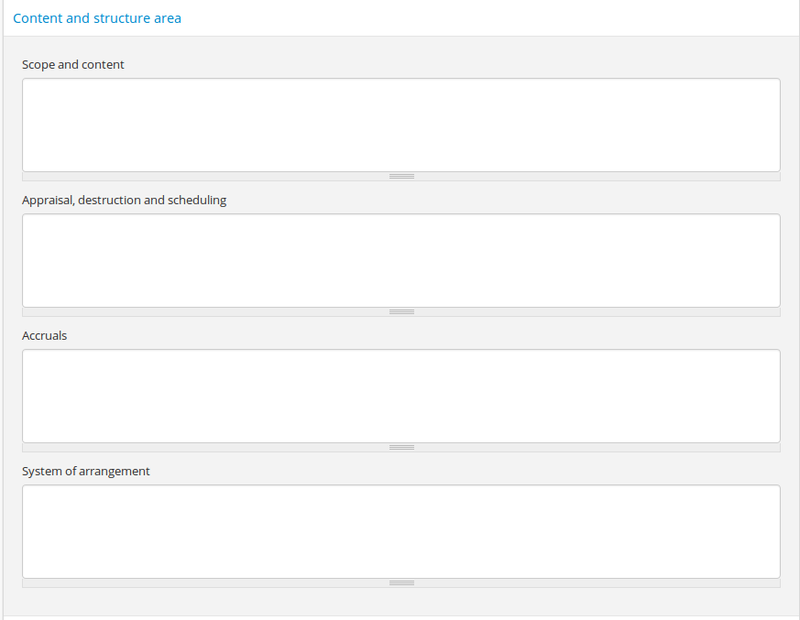 The data entry fields for the Content and structure area using the ISAD(G) template, including Scope and content, Appraisal, destruction and scheduling, Accruals, and System of arrangement. 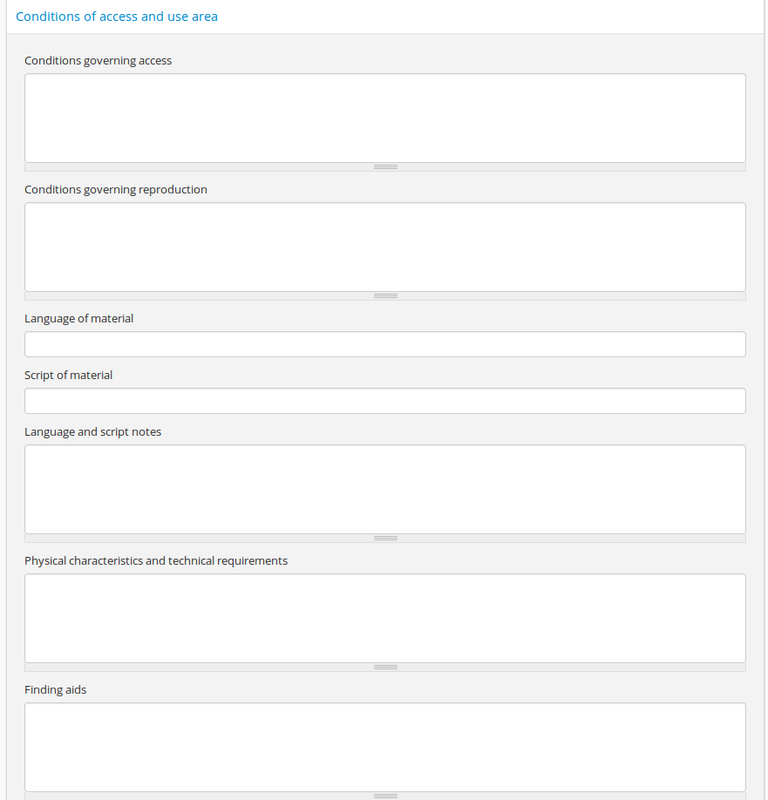 The data entry fields for the Conditions of access and use area in the ISAD(G) template, including Conditions governing access, Conditions governing reproduction, Language of material, Script of material, Lanuage and script notes, Physical characteristics and technical requirements, and Finding aids. 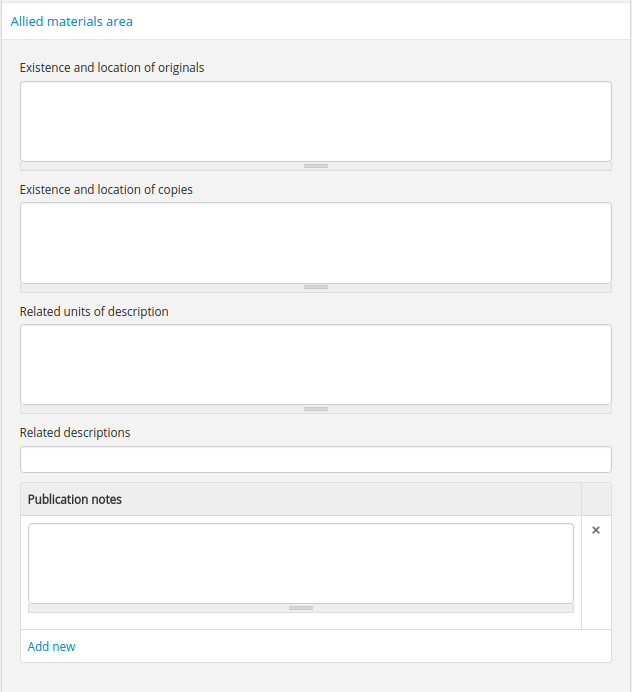 The data entry fields for the Allied materials area in the ISAD(G) template, including Existence and location of originals, Existence and location of copies, Related units of description, and Publication notes. The data entry fields for the Notes area in the ISAD(G) template. The data entry fields for the Access points area in the ISAD(G) template, including Subject access points, Place access points, and Name access points (subjects). 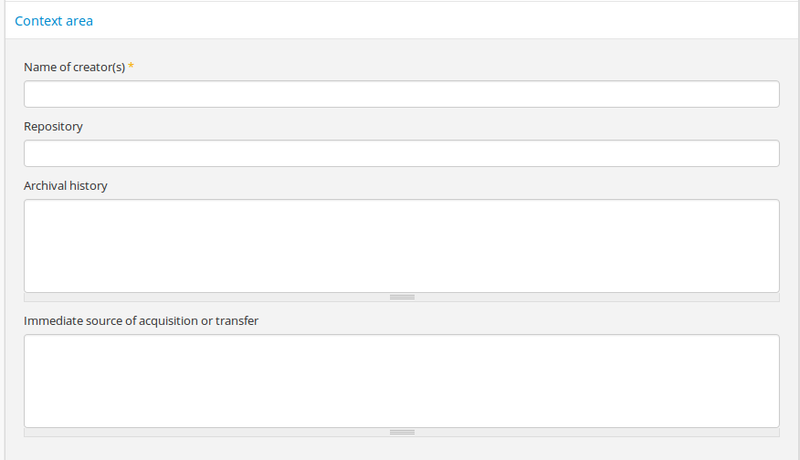 This field is an auto-complete - as you type, AtoM will suggest matches with terms already in the related taxonomy. If you do not explicitly pick a value from the drop-down menu that appears, AtoM will create a new term in the taxonomy. Warning: this means if you are not careful, it is easy to accidentally create duplicate terms (e.g. by pressing enter instead of selecting the match from the drop-down). In the CSV template, this column can accept multiple values, separated by a pipe | character. 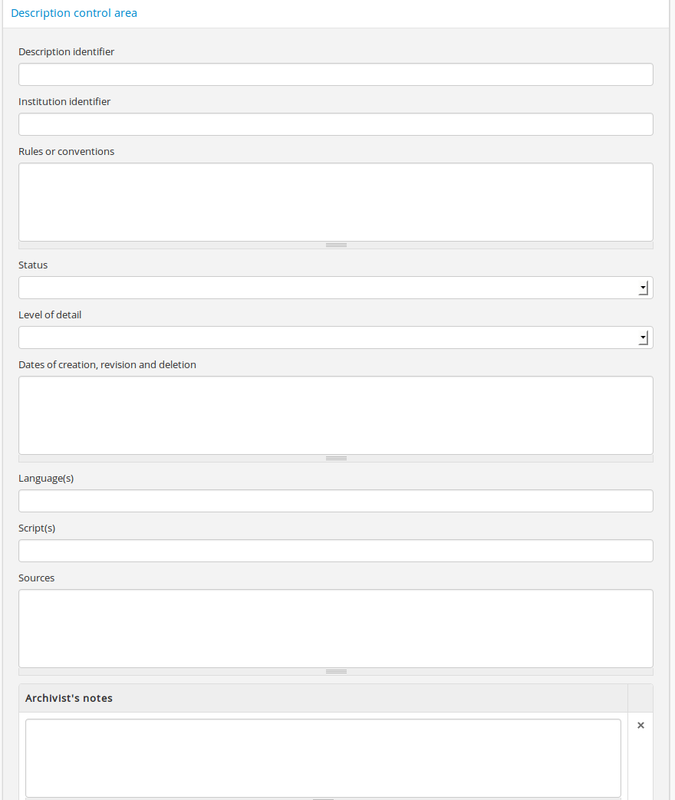 The data entry fields for the Description control are in the ISAD(G) template, including Description identifier, Institution identidier, Rules or conventions, Status, Level of detail, Dates of creation, revision and deletion, Language(s), Script(s), Sources and Archivist’s notes. This area of the description allows users to enter a rights record compliant with PREMIS. These fields are separate from the ISAD Conditions and access of use area, above, and editing one area does not effect the other. Rights records cannot be imported with descriptions via CSV. Rights are located under the More tab visible on the archival view page for logged in users.